Projects that I am working on or have worked on. The most recent activities are at the top. My dead bug Gnat 1. No audio was ever detected. Click to see a closer view of the dead Gnat 1. A week or so ago, I posted a note about the Gnat 1 single transistor QRP transceiver. I was excited about building this little project. I gathered up the parts and warmed up the soldering iron. The project went together easily. After all, there are only about a dozen parts or so, what could go wrong? Oh, what a loaded question that was. I decided to construct the 80 Meter model. I live about 20 miles out of Helena, MT, and if I was successful in getting this little rig working, I wanted to see if a fellow Ham in Helena could detect my signal. After completion, I attached the power, and antenna. I hooked up the oscilloscope and frequency meter, and powered the rig up. I was immediately gratified with a signal when I shorted the “key” line. It looked like I was getting out between 200 and 400 milliwatts, depending on the power supply voltage. This is where the fun ended. I was never able to detect any sort of audio out of the little rig. I followed the tuneup procedure in the instructions to the tee. The instructions were easy to follow and the results were exactly as written, but through all of the test procedures, I was “NEVER” able to detect any audio. After several days, I think I am done with it. Unless something else pops into my mind, I will cut my losses on this one and continue on to the next project that is begging for my attention. We have a young child that tends to wake up several times in the middle of the night and wanders around. He is Mr. Houdini and can escape any child proof system. We have found him outside in the middle of the night while it was raining, and he was happily playing with his trucks. We needed some sort of system that would wake US up if he got out of bed. This project is the result. We have used the X10 system for several years to control lamps, Christmas lights, and decorative fountains. The X10 system sends and receives signals that are put onto the power lines inside the walls of the house. There are also wireless modules that will detect a radio signal, and upon detection, it will send the proper X10 ON or OFF signal through the house’s power lines. I devised a combination of these devices to turn on a simple homebrew oscillator that we put in our bed room. When our child gets up, it turns on the alarm in our room, and we can short circuit our child’s plans. Over time, he is slowly learning that he can not be successful in getting up in the night, and will stay in bed and fall back to sleep. This is the setup: We put a wireless motion detector above our child’s head on the wall. It will not detect anything during his normal tossing and turning but if he gets up, the detector will detect his motion and send a radio signal to a receiver. The receiver is plugged into an outlet in the hall; and transfers the signal it received to the house wiring where it is sent to our bed room. In our bedroom, we have a module plugged into an outlet, that is constantly monitoring the house wiring for signals. When it receives the appropriate signal, it turns power on to the outlet on the bottom of the device. I have an AC adapter plugged into the module that powers a small alarm that sits on my bed stand. The alarm, is a simple NE556 dual timer circuit. It is wired up in a fashion that emits a BEEEP BEEEP BEEEP, on and off at half second intervals. The frequency of the BEEEP is about 700 Hz. Not too high pitch, and not too low. The circuit is built inside an Altoid Mints tin. When the alarm goes off, one of us will get up and put our child back to bed. We then use the remote control to send a wireless signal to the radio receiver in the hall outlet. The receiver then sends the signal over the power line again back to our bed room, and shuts off the alarm. I built an LED into the Altoid’s tin as a visual indication when the alarm is on. I also put a switch on the tin to shut off the speaker in the tin. This is because we don’t want the alarm to be tripping all day long whenever someone is in the bedroom. Also, the motion detector will send an “OFF” signal if there is no more motion in its range within a certain amount of time. Click HERE to see a larger slide show of the setup. 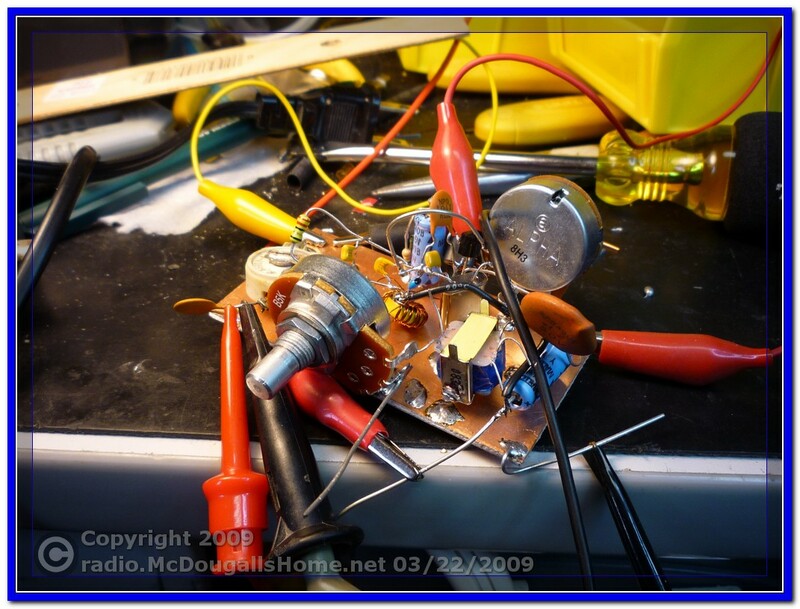 Here are some photos of a simple power meter, and a QRP receiver and transmitter that I built in March and April of 2007. All of them were from “Experimental Methods in RF design“. 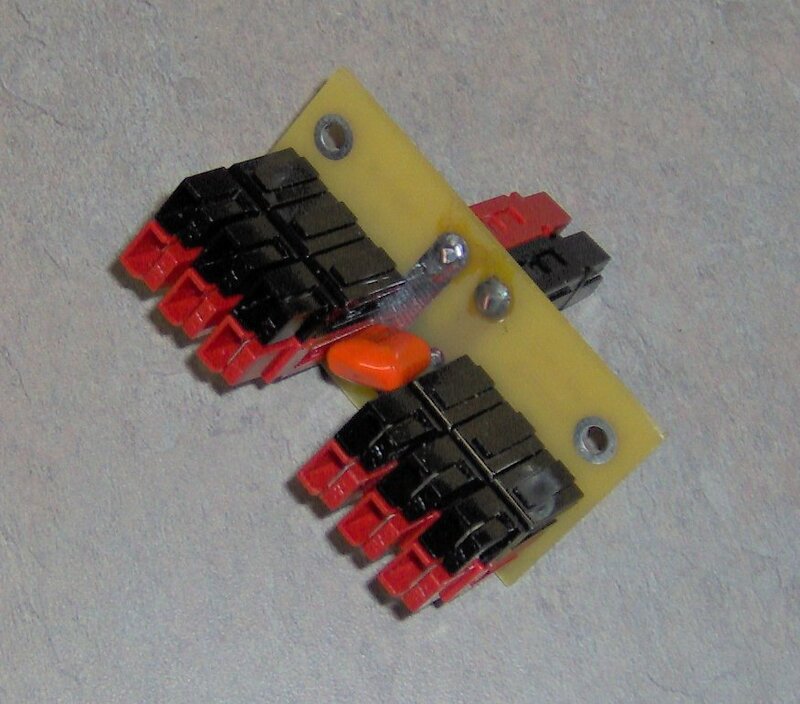 Don, W7MRI, designed a simple little circuit board that holds several sets of Anderson Powerpole connectors. These connectors are quickly becoming a standard connector for low voltage DC applications. Go HERE to see a photo essay of the construction of one of these simple kits provided by Don.